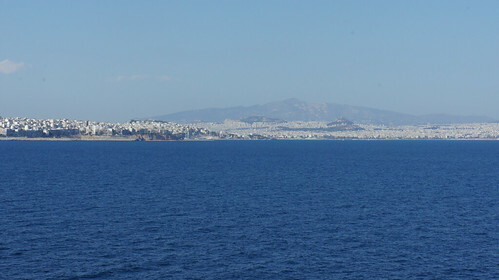 The port suburb of Piraeus is a chaotic, bustling mess. It takes a while to figure out which pier we’ve docked at, and how to get to the Athens Metro on foot (about a 20 minute walk). At the Metro I lack coins for the machines and stop by a small cafe to buy an over-sweet frappe for change. 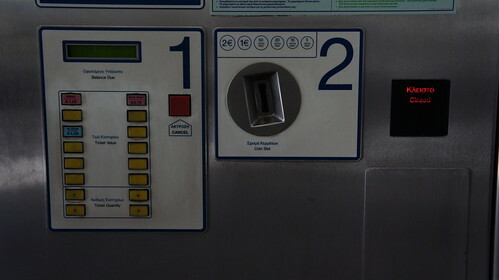 I have trouble operating the first Metro ticket machine before belatedly realizing that it is out of service. 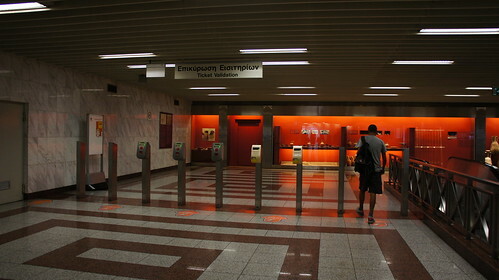 Ticket validation is a bit confusing since there don’t seem to be any actual turnstiles or faregates — just pillars with beeping validator scanners on them. Things smooth out a bit once we actually get on the Metro, and Athens gets nicer the deeper we go into it. I do so love that Metro stations double as archaeological museums. 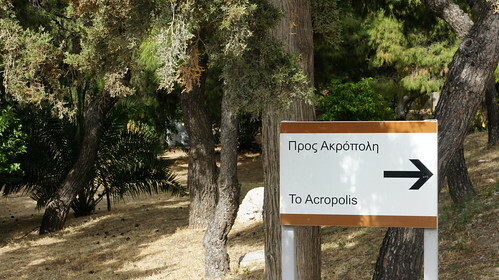 We emerge from Akropoli Station into the pleasant and walkable neighborhood surrounding the lightly wooded hill on which stands that great old Greek landmark. Openings in the fence lead to ticket booths beside paths going up the hill — and we have lucked out: it’s a free admission day, so the regular 12 euro entry fee is waived. The path goes up a gentle slope, passing by the Theatre of Dionysus Eleuthereus, the Temple of Themis, and the Odeon of Herodes Atticus before we reach the Propylaea, the grand gateway to the Acropolis. 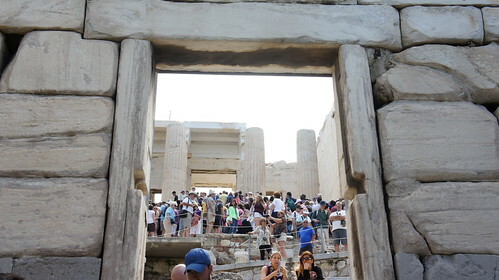 As we approach, an epic crowd is revealed, lining up to enter through the bottleneck of the Propylaea. We pause at the Beulé gate to gird ourselves for the slog through the crush over marble worn cracked and smooth by centuries of travelers’ footsteps just like ours. 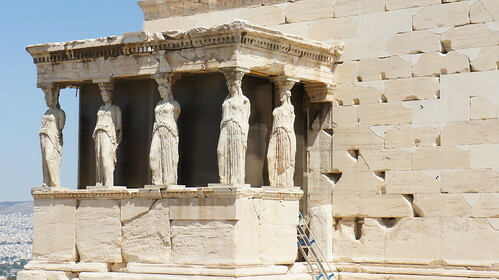 Once through the Propylaea, the crowd disperses, and the Acropolis itself is spread out before us: to the north, the Erechtheion with its Porch of the Caryatids; and to the south, the famous Parthenon. 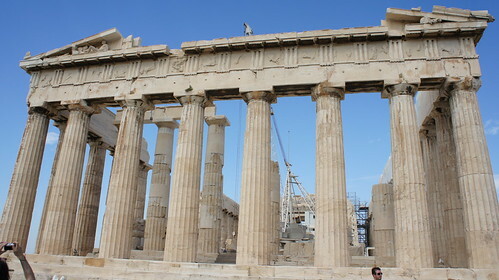 It’s worth noting the Parthenon stood mostly intact from its completion in 432 BC till 1687 AD when Venetian bombardment ignited an Ottoman ammo stash in the temple building. 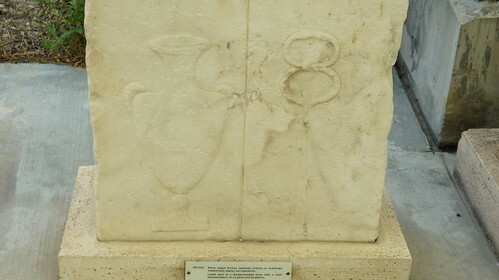 The resulting explosion caused much of the damage we see today — damage made worse by the plunder of the Elgin Marbles . 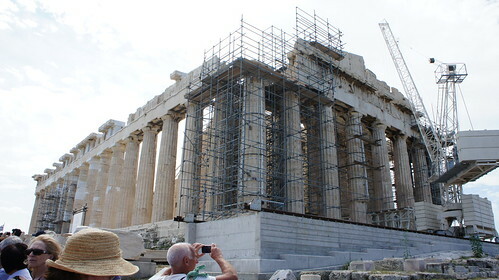 Lots of restoration going on, with scaffoldings scattered amongst the ruins, and newer marble highlighting the pillars and pediments as restorers fill gaps in the structure and compensate for damage from older, less careful restoration efforts. 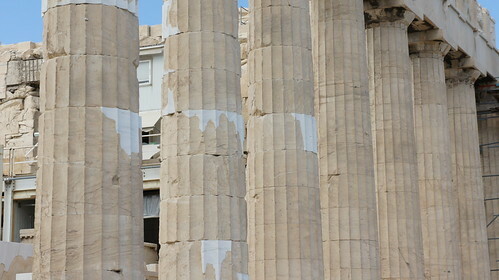 They say the restoration is almost done, though personally I wouldn’t mind if they went whole-hog and just rebuilt (and repainted) the whole site as it was at its Hellenistic-Roman peak. 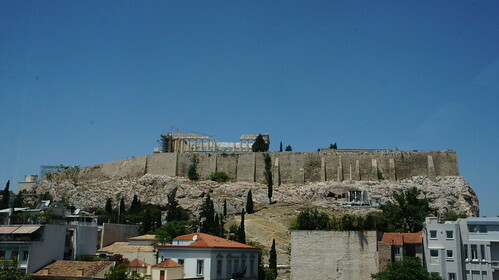 At the east end of the Acropolis is a little fort with a giant Greek flag and a plaque commemorating World War II Greek resistance against the Nazis. 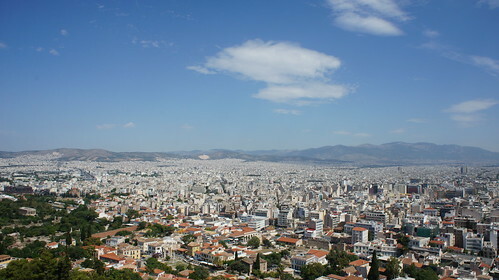 From atop the fort one can sit on cool white marble and take in sweeping panoramic views of Athens and the Parthenon and the rest of the Acropolis. 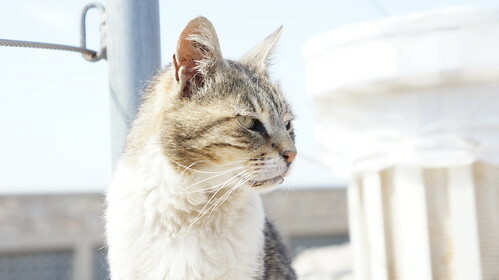 There are cats up here. 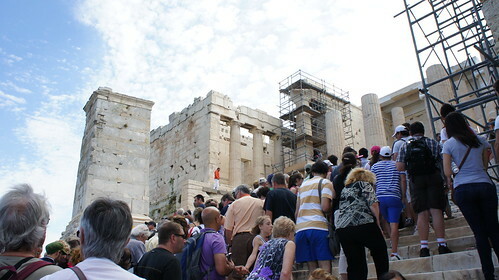 When we’ve had enough of the Acropolis we squeeze back through the crowd exiting the Propylaea and descend, pausing en route to take in the view and examine a few ancient sculptures on display nearby. 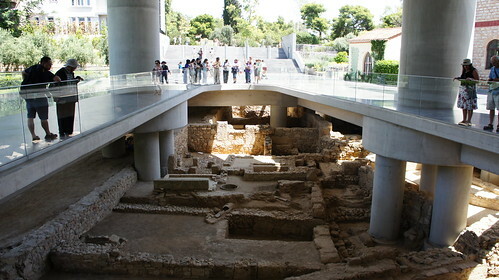 Next up is the Acropolis Museum, where actual artifacts from the site are displayed. We have lunch in the museum (would have preferred something in the Plaka District but time is tight) where I order a trout and spinach salad. It comes gloriously soaked in olive oil. 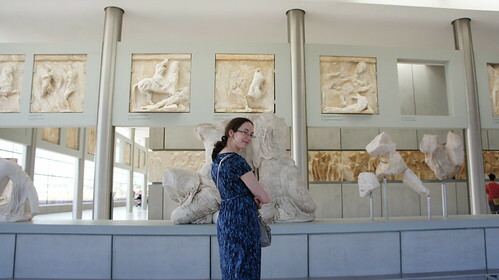 The rest of the afternoon is spent neck deep in more Acropolis history, viewing original pediments and metopes and friezes and sculptures and artifacts, and looking out the top floor Parthenon Gallery windows at the hill of the Acropolis. Also of interest is the archaeological excavation directly under the museum, viewable through openings in the floor and thick transparent acrylic flooring. It would be nice to stay and see more of all this history, and browse the Plaka District and see what else is in Athens, but we have an hour till the ship leaves so it’s time to get back to Piraeus. I somehow manage to crumple up my all-day Metro pass and it won’t validate anymore and I have to buy another one-way ticket and I’m pretty mad at the Athens Metro system by then. 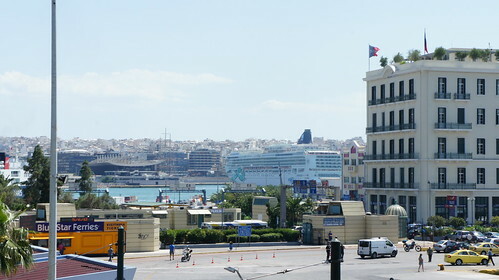 The walk back to the ship through Piraeus’s messy pedestrian infrastructure on a hot day doesn’t help my mood any, but soon we’re back on board and watching departure from Athens from our balcony. 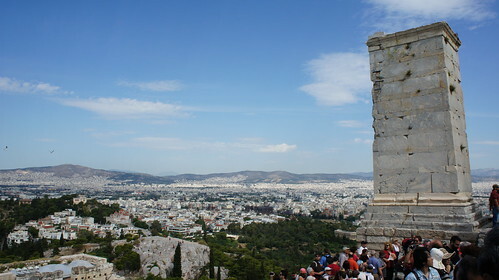 Full Athens photoset on Flickr.